An Iranian defense official said Wednesday that there is no other way but to destroy Israel, ahead of this week's al-Quds Day, Iran's ISNA news agency reported. Gholam Reza Jalali, who heads an Iranian military unit in charge of fighting sabotage, said that al-Quds Day, which will be marked by Shiites around the world on Friday, "is an expression of the fact that there is no other way but to stand firm and resist until Israel is destroyed." It should be noted that Iranian senior officials tend to employ even tougher rhetoric against Israel ahead of the last Friday of the Ramadan which falls on the global al-Quds day this year. Millions of Shiites in Iran, Pakistan, south Lebanon and Bahrain take to the streets that day to voice their outrage over Israeli "injustices" perpetrated against Palestinians. "The world's Muslims must help and support the Palestinian people until Palestine is liberated," General Jalali said in a statement. He added that the Islamic nation is more steadfast than ever in the face of "Zionist threats" noting that Syria's Islamic front has become even stronger. Meanwhile, families of Iran's slain nuclear scientists filed a lawsuit against Israel, the US and Britain accusing them of involvement in the assassination of their loved ones. 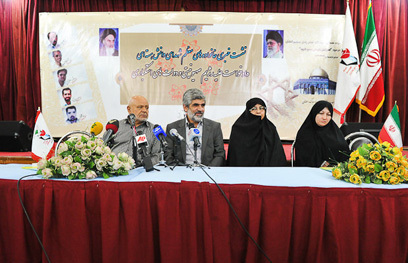 Rahim Ahmadi Roshan, the father of one of the scientists, told a press conference in Tehran Wednesday that the families have demanded Iran's judiciary to pursue their complaint through international bodies and bring those behind the murders to justice. Iran's state television broadcast purported confessions earlier this month by 14 suspects in connection with the killing of five nuclear scientists since 2010. Also Wednesday, Muslim heads of state convened in Mecca at a summit of the Organization of Islamic Cooperation. The 57-member body was expected to suspend Syria in a largely symbolic decision which will have little practical effect, but will underline Assad's isolation in much of the Sunni-majority Islamic world. To preserve a facade of Muslim unity, Saudi King Abdullah welcomed leaders to the Mecca summit with Iranian President Mahmoud Ahmadinejad beside him. The two men were shown on Saudi state TV talking and laughing together. "It was a message to the Iranian nation and, I assume, to the Saudi people, that we are Muslim and we have to work together and forget about our differences," said Abdullah al-Shammari, a Saudi political analyst. See all talkbacks "Iranian general: Israel must be destroyed "